If you’re a visitor returning to Bequia then you already know about the natural beauty and tropical charm of our lovely island. If you’re planning your first trip to the island, rest assured you’ll quickly fall in the love with Bequia as well! 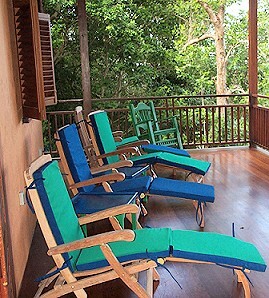 We’re committed to providing the very best Bequia rentals for your holiday. The Nest offers spacious tropical accommodation in a relaxing setting while still be close to the beaches and activities. Bequia rentals come in all sizes and prices. The Nest, with 1 king-sized bed and 1queen-sized futon couch, is the perfect accommodation for an intimate getaway, a small group of friends or a small family. Please contact us at treehouse@vincysurf.com with any questions you may have.